Sisters Lauren, 8, Emma, 5, and Brie, 9, D'Angelo, of Newtown Square, Pa., test out their artistic skills at a table during Sea Isle's Fall Family Festival. 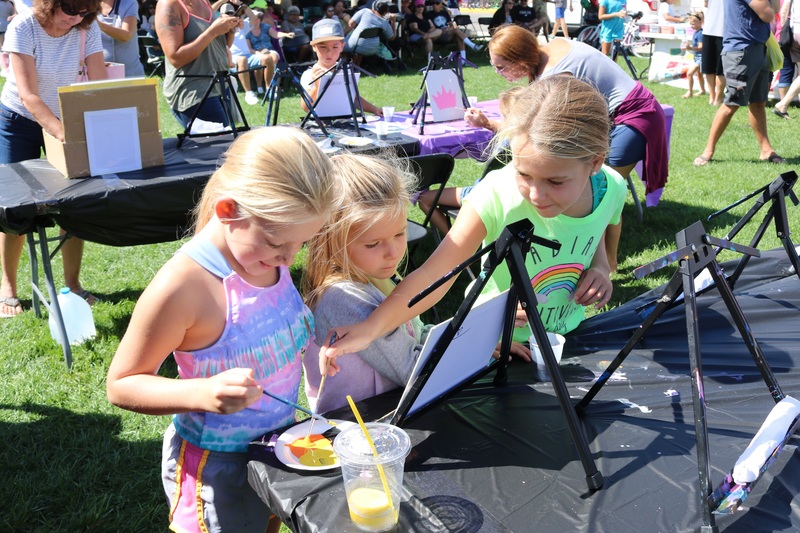 Sisters Brie, Lauren and Emma D’Angelo, of Newtown Square, Pa., worked together on their mini-masterpiece at a table at Excursion Park filled with canvasses and paints during Sea Isle City’s Fall Family Festival on Saturday. They were pretty much in agreement on how to create their work of art. 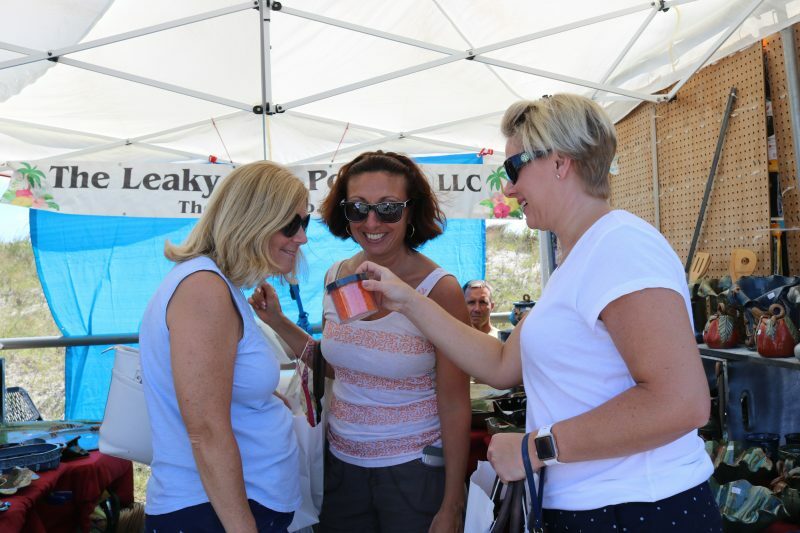 But they disagreed about what they liked most about the festival, which brought hundreds of families to enjoy under sun-splashed skies and temperatures in the high 70s. “It’s so fun painting,” 8-year-old Lauren said. “I like going on the rides the best,” shouted Emma, 5. Brie, 9, had something else in mind. “I like eating all of the food,” she said to the laughter of her sisters and mother Jen D’Angelo. Police Chief Tom McQuillen hands Brynn Gaynor, 5, of Upper Township, a toy police hat with Officer Ciara Williams. 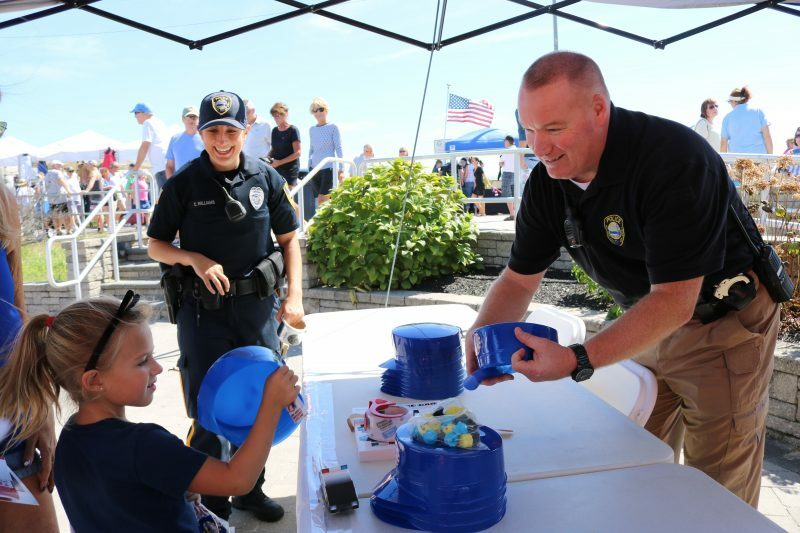 Police Chief Tom McQuillen called the day and the weather “picture perfect,” as he and other officers handed out police stickers, plastic blue “police hats” and literature. Their tent was so busy that they had to replenish their stock of freebees and it was only early afternoon. “You couldn’t ask for a better day or event,” McQuillen said. 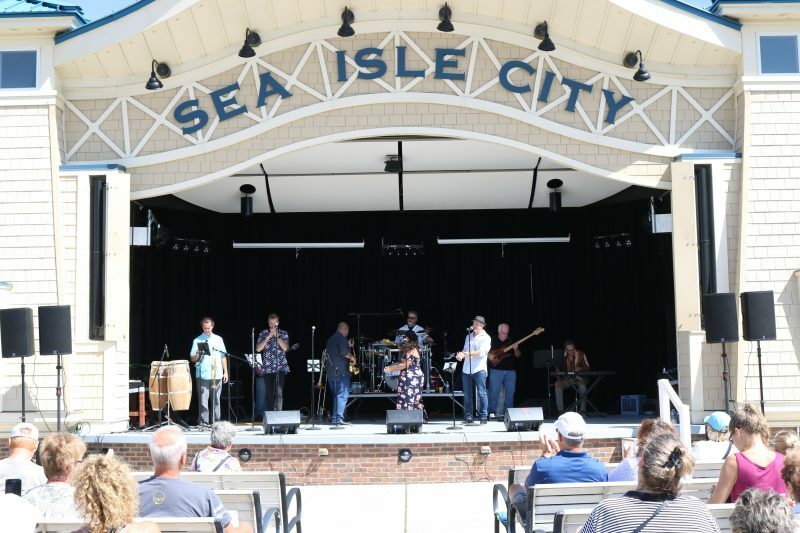 Families spent the day listening to a live band perform at Excursion Park, while nibbling on hot dogs and other treats. The children took in all of the amusements, which included a very popular bouncy slide and rides. 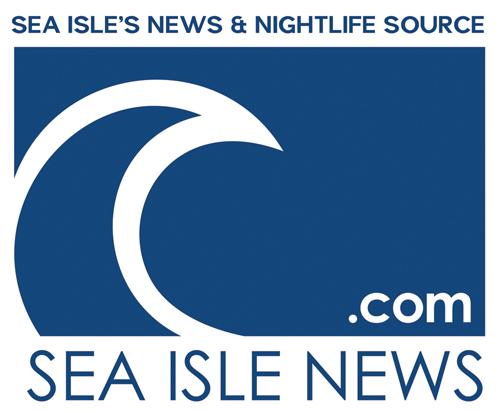 Festival goers enjoy live music at Excursion Park. Kris and Jess Kieres, of Phoenixville, Pa., are making the festival a family tradition. 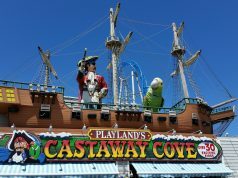 They brought their two children, Kellen, 3, and 4-month-old son, Kole, to take in the sights and activities. Kellen proudly showed off his freshly-painted face and pointed to a mouse with big ears on his cheek. Then Kellen ran over to a ride. Then the family was off to Kellen’s ride – a “fire house” where kids get to leap and slide like firefighters. 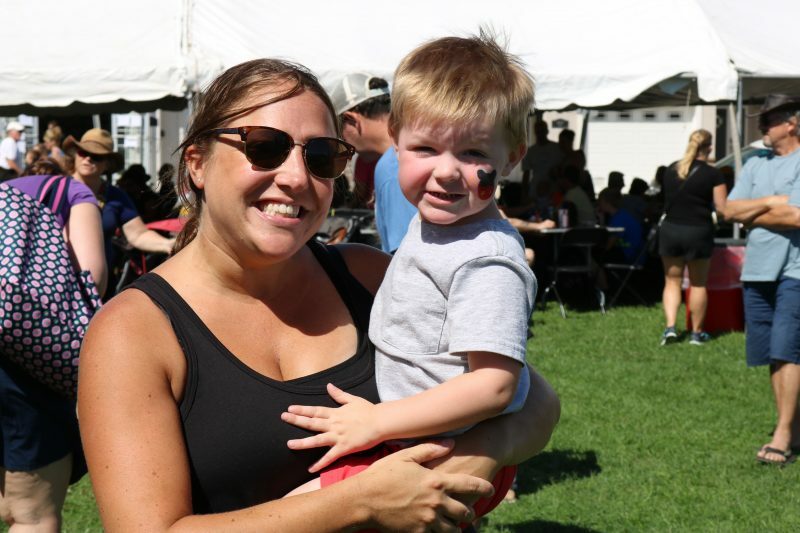 Jess Kieres, of Phoenixville, Pa., holds her son, Kellan, 3, who is all smiles after he got his face painted. In addition to the amusements at the park, there were about 300 vendors with displays along the Promenade. It made for a shopping mecca. 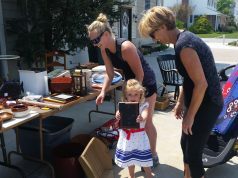 Festival goers had an array of choices from clothes, to artwork, to jewelry and toys. 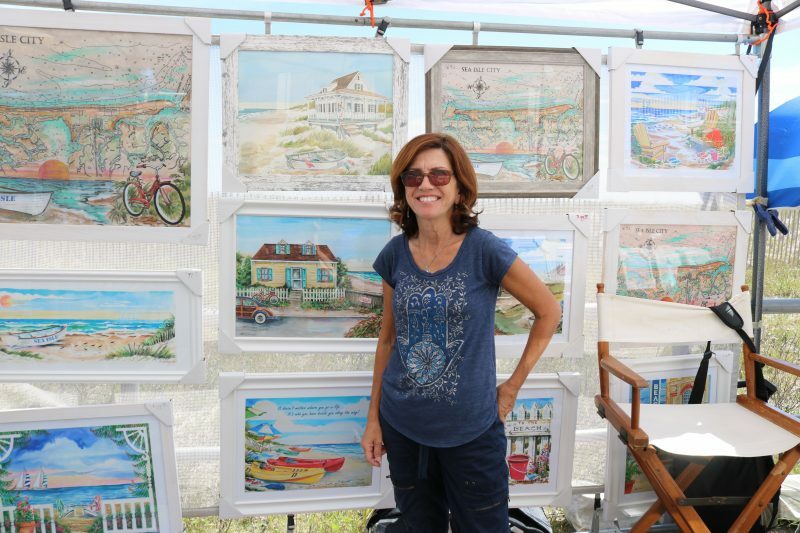 Artist Donna Elias and her partner, Les Kammerman, of Bayside Gallery and Coastal Gift Shop, located in Gardner’s Basin in Atlantic City, said they love doing the festival. “We always do well here. We are here in the spring and the fall,” Elias said. Kammerman said Saturday they were swamped. “We are doing really good,” he said. Artist Donna Elias says the festival brought lots of customers to her display. Travis Delsignore, of Delaware, wasn’t really into artwork or clothes. 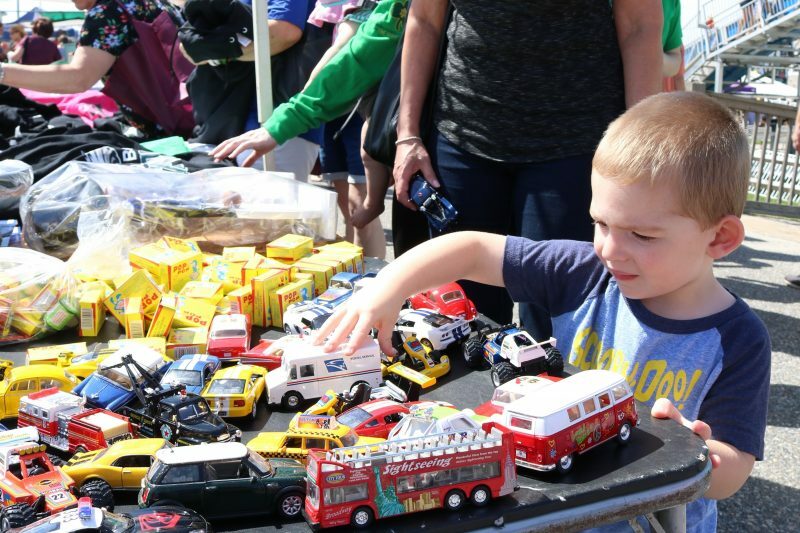 The 2-year-old boy spotted a table filled with toy cars and appeared mesmerized. 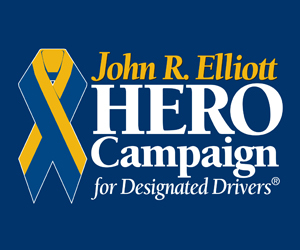 “He loves cars,” said his grandmother, Kim Delsignore, while chuckling and asking him which one he wanted. Travis pondered a bit. He picked up a police car, an ambulance and a fire engine and then went with the police car. For some, the festival was just an added bonus to an already planned girls weekend. Best friends Janette Indelicato, Cathy Weierbach and Hope Fisher, all of Perkasie, Pa., made the most out of their weekend and the festival really topped it, they said. They each held a bag with new wares. They perused the vendors’ tents in search of interesting things to take home. They bought purses, checked out candles and meandered some more. 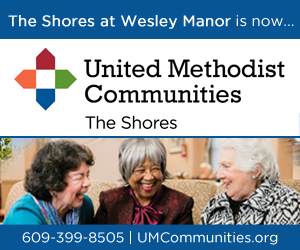 It was a girls weekend for longtime friends Janette Indelicato, Cathy Weierbach and Hope Fisher, all of Perkasie, Pa. 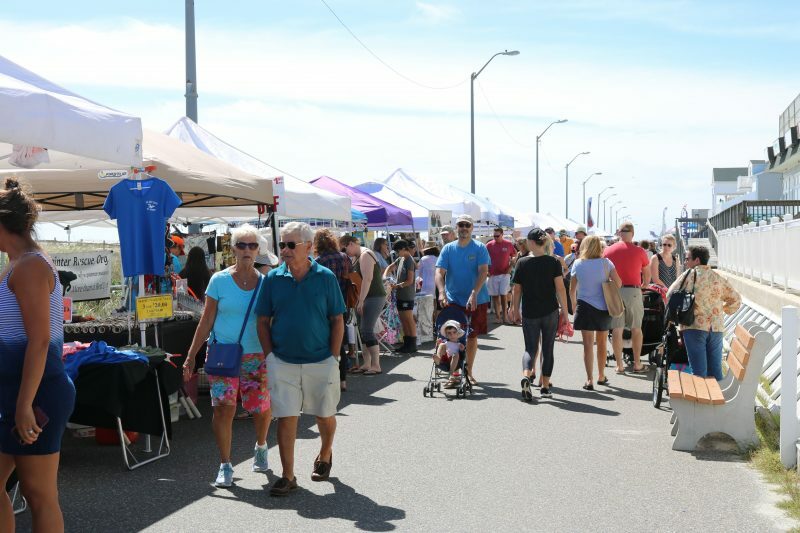 The annual weekend festival, considered the city’s largest fall event, continues Sunday with a vintage car show on the Promenade and other family-friendly activities including guided Historical Trolley Tours and live music from 9 a.m. to 1:30 p.m. rain or shine. The Fall Family Festival bustles with large crowds. 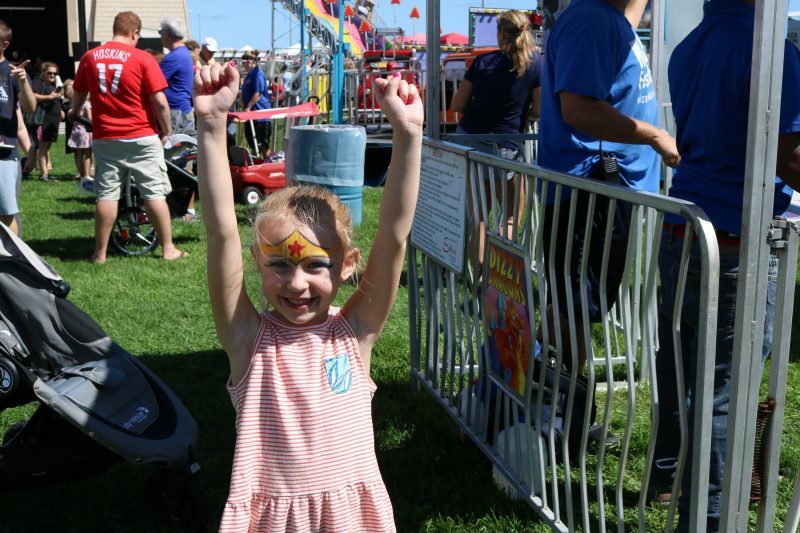 Ella Ashe, 5, of West Deptford, does her best Wonder Woman.